Set at a fictional New York music conservatoire, a jazz drumming student (Teller) chases his vision of success under the guidance of a mentor who will stop at nothing to make him reach his potential. Fletcher advocates a teaching method that is the polar opposite to Robin Williams' in Dead Poets Society. By humiliating the students and knocking them about he tries to coax true greatness from manufactured adversity. He's never going to simply say 'good job', as that's not going to push anybody. It's almost sadistic and you do question whether it is worth it. Would you put your child through that? Would you put yourself through that kind of distress just on the off chance you might excel that fraction more? Whiplash doesn't begin to answer this though the denouement does show Andrew as some unstoppably dazzling force, reaching that level of greatness, nailing it. It doesn't noticeably put forward the wider questions about art, whether it is worth the harm, the self flagellation that people like Andrew subject themselves to. Do you put yourself through the ringer at the prospect being great or should you settle and not dice with that madness that accompanies seeking true potential. I have been thinking about this recently with regards to method acting. There is nothing inherently brave in someone like Eddie Redmayne taking on the character of Stephen Hawking which would require such a transformation. What's impressive is the result, not the method. I find the performance admirable, not the meticulous method and hours that went into it. Maybe Eddie could have achieved the final result without putting his back out of alignment, we will never know. But Whiplash seems to suggest that Andrew wouldn't have reached such a performance without woodshedding. There's something almost religious, philosophical about that level of intense discipline. The act of taking himself away and dedicating himself to living his craft, the notion of patience and taking however long it takes to get to that point. It seems indulgent to me, but I suppose to a true artist it is necessary. 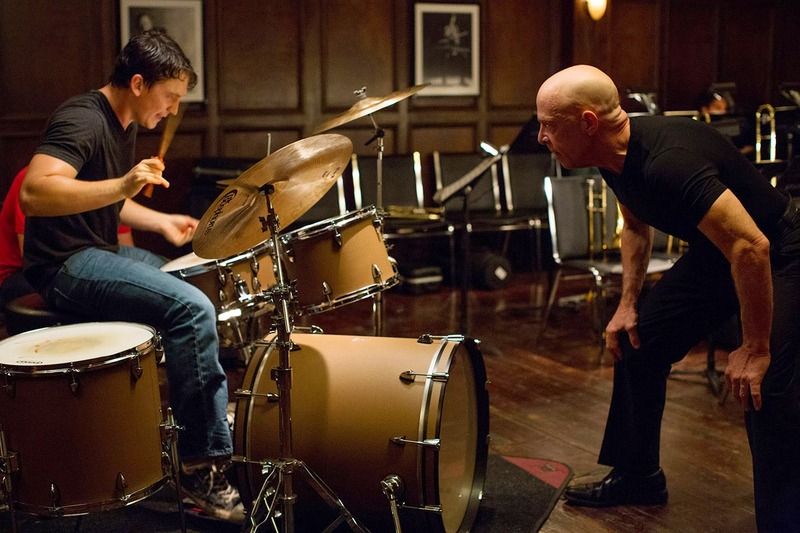 Whiplash is a thrilling and uncomfortable watch. It reminded me of The Wrestler, The Fighter and particularly Black Swan. I like films of that ilk, about a craft and the human condition. You get that immersed that you find yourself thinking the world will come tumbling down if Andrew messes up. It's only when you take yourself away from it objectively and think 'so what?' that you realise it isn't life and death, though it may seem that way to Andrew. The risk of missing a beat has never been so tense, and it almost certainly won't ever be that tense ever again. I do have some reservations however, and they're qualms that are preventing me from becoming properly invested in Whiplash. I found Simmons to be a bit cartoony, so over the top vicious that he could not be real. That may well be intentional but I just couldn't go with the notion that fully grown men would let someone talk to them so outrageously no matter how well respected they were. I think I would have written him differently. Similarly, it gets a bit unbelievable in the second act and it frustrated me because it was so elegant, it didn't need the implausible melodrama. The love interest was superfluous and mildly distracting but nicely drafted and did illustrate how driven Andrew was by showing what he was prepared to forgo in pursuance of perfection. There are a great deal of five star reviews out there for Whiplash and it sort of makes me wonder if I am missing something or didn't take away from the picture what the director had envisioned. And yet I did really like it. Especially the aesthetics. The editing was beautiful and mesmerising in a very surreal and immersive way. The ending is the magnum opus. Frenetic, feverish and exciting; a knife edge balancing act of the clinical precision of jazz against the raw desperation of trying to execute a performance without fault.